PHUKET: Roughly 800,000 foreign tourists are expected to take part in concurrent celebrations of Chinese New Year and Valentine’s Day in Thailand today, with many of them having arrived in Phuket on charter flights. Tourism Authority of Thailand (TAT) Governor Suraphon Svetasreni said on Friday that 120,000 ethnic Chinese were expected to arrive inn Thailand from China, Malaysia, Singapore, Hong Kong and Taiwan between yesterday and next Saturday, February 20. Forty-four charter flights would bring tourists to Bangkok from China, while 74 flights would shuttle them down to Phuket and five more to Koh Samui, Mr Suraphon said. “The TAT hopes Chinese tourists will spend 770 million baht on the dual events,” he said, adding that ethnic Chinese were a key market segment in February. Meanwhile, many general tourists plan to hold weddings in Thailand on Valentine’s Day today. The TAT also predicted that four million locals would travel within the country for the celebrations, especially to the 10 provinces holding special Chinese New Year events, like Phuket. Thai Hotels Association president Prakit Chinamourphong said hotels in Bangkok received a 30% increase in advance bookings for the period around the dual holidays. However, many hotel operators say they regret that Chinese New Year and Valentine’s Day overlap, because they lose the chance to cash in twice. Hotels, restaurants and family-entertainment operators in Phuket are offering promotions to lure customers this weekend. For details of 18 events scheduled for Phuket today through February 20, see the Gazette‘s Events Calendar. 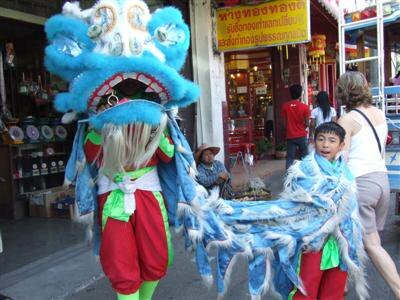 As part of Phuket’s Chinese New Year celebrations, the Phuket Old Town Festival will also take place, from February 19 to 21. The Tourism Authority of Thailand and Phuket City Municipality are promising more activities than ever during the event, now in its 11th year.